Warning! This post contains lots of building science concepts and terms. I’ve tried to explain some stuff but this article is for the folks like me that enjoy the nitty gritty science of building. As Jill pointed out a few weeks ago in her gardening post, I’ve been working on the basic energy calculations for the new house design. It took me a while to get the basics down, again. It’s been some time since I did this stuff in school and I’m pretty sure I’ve messed up some things, but it gives me a bit more understanding into how all the parts (walls, windows, floor and ceiling u-factors, infiltration rates, required ventilation, heat loss, solar heat gain, shading factors, heating degree days, vapor barriers, dew points in the wall and ceiling assemblies, etc.) contribute toward an energy efficient system. 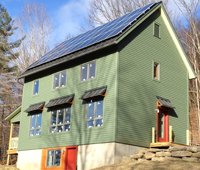 I’m interested in the net zero house concept (make as little energy as you can to meet the power needs of the home, netting out over the year) as opposed to the off the grid house (which has the same concept except you have to net out every time the sun sets). The basic concept is to invest in energy conservation until its more cost effective to invest in energy generation. At a certain point the scales tip and its cheaper to invest in solar or wind power than walls that are three feet thick with quintuple-pane windows in a perfectly sealed box. There’s also opportunities to offset some costs, for example the extra cost of insulation in the walls and ceiling should balance out with a cheaper heating system. I’ve put together a spreadsheet that captures one half of the net zero concept, the energy conservation part. I can fiddle with the r-values, glass area, window properties, shade factors, allowable infiltration rates, ventilation air changes, heating degree days (HDD), even square footages and see approximately how the system balances out in a year. Problem is that it all depends on what you put into the inputs. 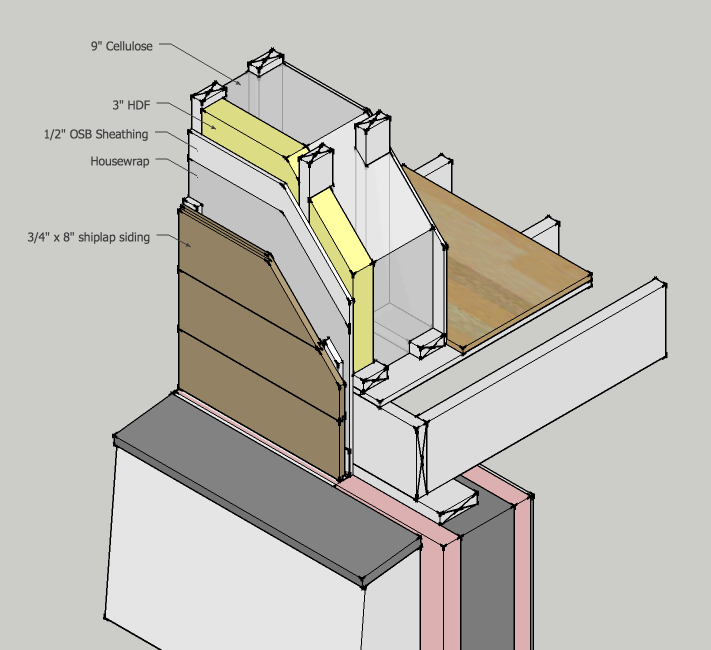 Do you use center of wall r-values, or averaged values based on thermal bridging and convective heat flows in the wall? This can change the outcome quite a bit. A typical 2×6 stud wall @ 16 inches on center is usually described as having an R value of 20. But studies show that it is closer to an actual R value of 13.7, or 32% less effective. But typically in all the examples of energy calculations that I’ve seen, they use the R 20 value, not the 13.7. Does this inflate the energy efficiency of the house, or does the calculation itself have built in factors to account for the inaccurate R values that are typically used? If you plug the 54 R value into the spreadsheet you would see that you need approximately 18.9 million BTUs per year to keep the house above 65 degrees. If you use the R 44 value, you would need approximately 19.7 million BTU’s per year, or close to a 4% difference. Anyway, if you’re interested in the actual calculations, I’ve included a PDF version. Add a comment below if you’re interested in the spreadsheet version. I’ll add another post soon with links to more the books and online sources that I’ve found helpful. I have a series of posts planned for the next couple of months including window options, ventilation choices and calculations as well as more wall sections. I’m also planning a high-level cost estimate so I can approximate the trade-offs between energy conservation and generation. I hope all you building science geeks out there enjoy.